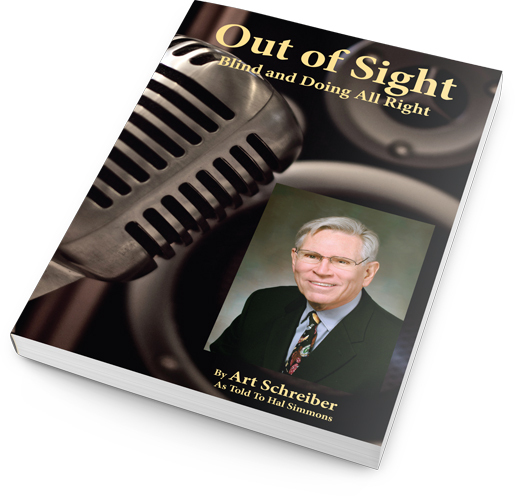 Art Schreiber was near the top of his profession as a radio news station manager until a fateful night near Santa Fe, New Mexico, when he lost his eyesight. During his career ascendancy, he interviewed such notables as John F. Kennedy, Dr. Martin Luther King, Jr., and the Beatles. Before moving to New Mexico to manage KOB-AM Radio in Albuquerque, he was general manager of KFWB-AM in Los Angeles. For several years prior, he ran Westinghouse Radio’s national and international news service operations in Washington D.C.
His life changed frightfully when he awoke one morning, the last day of his vacation, at a resort outside Santa Fe. It was so dark. He could not understand why the desk clerk was calling him in the middle of the night. In fact, it was the morning wake-up call he had requested the prior evening before he went to bed. And the sun was up! Only it wasn’t up for Art. From the successful heights of a radio news broadcasting career, his loss of eyesight caused him to plunge to the depths of despair. Out of Sight is the inspiring story of how one person was able to pull himself together and begin a new way of life in a new world. 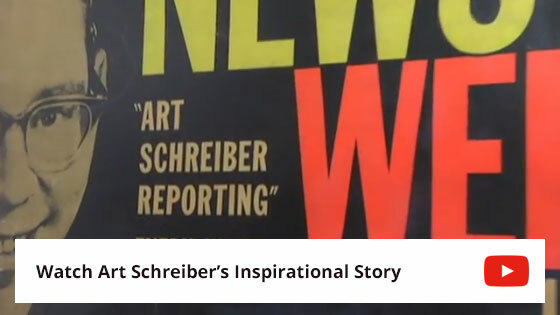 "This slim volume contains stories of courage and compassion, illustrating Art Schreiber's willingness to reach out to those who have lost their eyesight and say to them: 'Follow me. I know the road you need to take. I’ll show you how to get there.' "
My book, Out of Sight...Blind and Doing All Right has been awarded First Place at the Arizona / New Mexico Book Awards.